Configuration of individual ports and features. Each individual port is configured using the menu on the lower portion of the monitor main page. To select a port, click on the SET button which will turn orange to indicate it is active. Once active, the menu options below will apply to the indicated port. The CONFIGURATION menu allows you to set a name for the port, and the Start Delay Time and Shutdown delay time from the pull down menu. You can select REAL-TIME or other given delay. The boot/shutdown MAC address fields are not presently used. 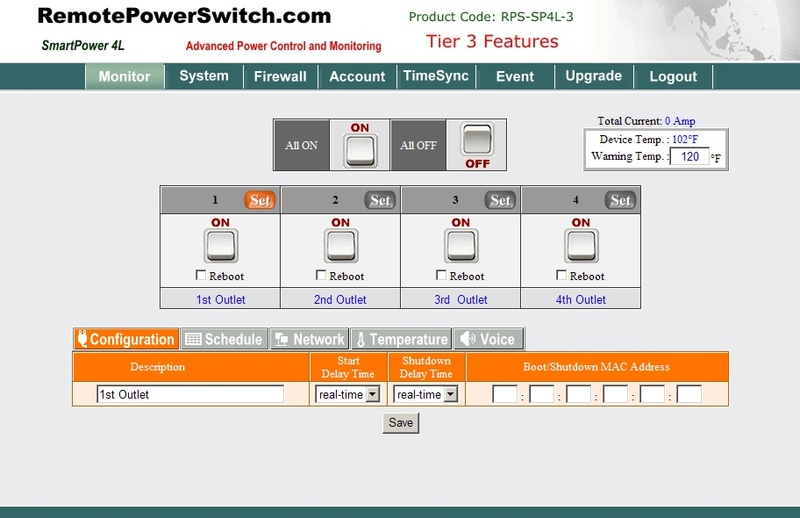 The SCHEDULE Menu allows you to program On / Off times at any point in the future for the selected port. Simply configure your date and time, select on or off and click the ADD button to enable the schedule for the selected port. The schedule can be set to reoccur by year, month, week or day. 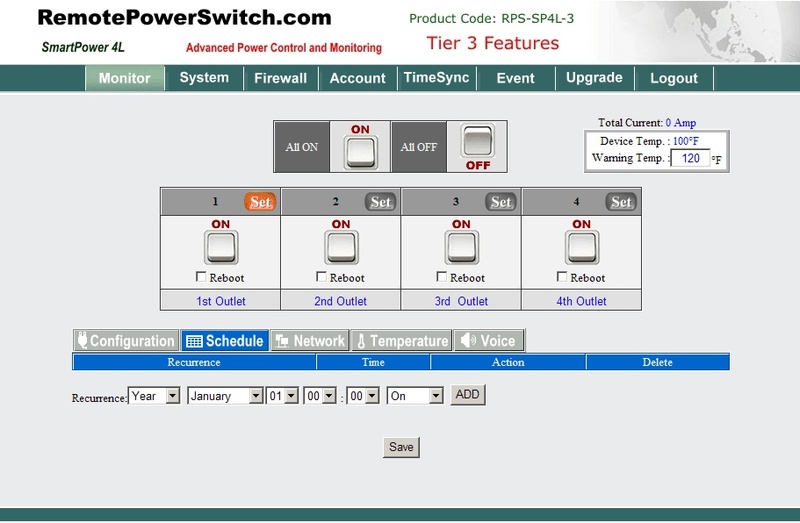 NOTE: This feature is only available on the Tier 2 and Tier 3 versions of the RPS-SPL4 remote power control units. Tier 3 Version Only ! 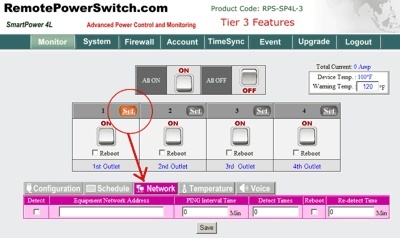 The NETWORK configuration option allows you to configure AUTO-REBOOT based on a network PING test. 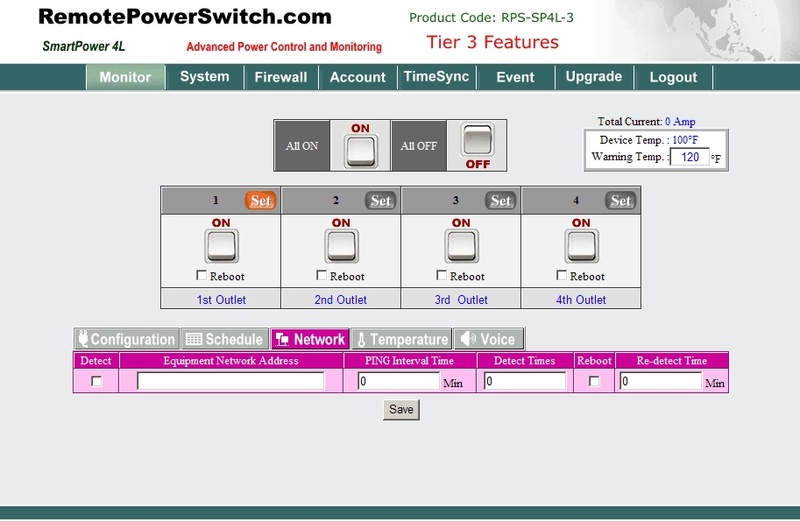 This is available on the Tier 3 Version of the RPS-SP4L unit only. Detect: This check box will allow you to enable the ping test for the configured IP address. Equipment Network Address: The IP Address of the device you want to monitor. This usually is the device plugged into this specific power port of the remote power switch. PING Interval Time: The interval time to send a ping to the connected equipment. Detect Times: When the Ping fails this number of times, a warning message will be sent by email. rebooted ( Power Off/On ). allow the device to fully reboot. NOTE: The IP Addresses used in the Equipment Network Address must be unique. Do not use the same IP Address on different ports. Use an extension cord plugged into a router and a modem if you need to reboot both items when failure occurs. The individual port limit is 6 amps. 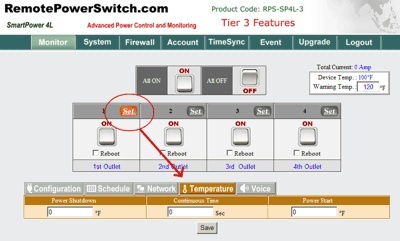 Power Shutdown: When the temperature of the RPS-SPL4 is over this set temperature and then exceeds the ‘Continuous Time’ given in the next configuration point, the power to this port will be shut OFF automatically. Continuous Time: When the temperature is over the Power Shutdown Temperature above for this amount of time the power will be shut OFF. Power Start: If the power has been shut off because of the two conditions above being met, the unit will turn the power ON when the temperature falls below this set temperature. risk. It is recommended that you run your own testing to determine suitablity for your purpose. 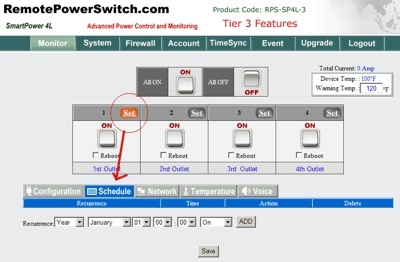 Note that you can set the above options for each of the power ports by selecting the SET button for that particular port depending on the version of the RPS-SPL4 Unit you purchase.